For all the talk about golf’s young stars, Tiger Woods is still the axis on which the sport spins. So we culled together our brightest golfing minds at The Action Network to give you the Hero World Challenge betting preview we were quite literally born to write. Players to target, Tiger props to pass and play, DFS studs, and a whole lot more … Dig in, folks, because the Big Cat could WD at any time (kidding, we hope). To get all the betting/DFS info your heart can handle, follow us on Twitter @ActionNetworkHQ and subscribe to our daily newsletter here. Woods comes into the 18-player field at 33-1 (per Bovada), the longest odds on the board along with Kevin Chappell and Charley Hoffman. It would be hard to justify backing Woods in this caliber of field at any number after such a long hiatus. Rickie Fowler (8-1): This is my top play; he’s notched a pair of third-place finishes in two starts at this course. He also comes in with good form, finishing in second place at the OHL Classic. I got him at 11-1 earlier. Brooks Koepka (9-1): Koepka is also playing well, winning in Japan at the Dunlop Phoenix Open a couple of weeks ago on the heels of a second-place finish at the WGC event in China. I was also able to grab him at 11-1 before his odds went down. Woods birdie or better on the first hole (+400): This is the most interesting prop for me. Looking at the hole itself, it’s a 423-yard Par 4 that requires a good drive to set up a short iron into an elevated green. The hole didn’t present much of a challenge in 2016, with 25 birdies compared to just two bogeys recorded in 69 rounds. Woods birdied the hole in the second and third rounds a year ago. Overall, this hole yields a birdie far more often than a 4-1 rate, so there appears to be good value. The only thing to consider would be some nerves or maybe a little rust on that first shot, which could put him out of position. 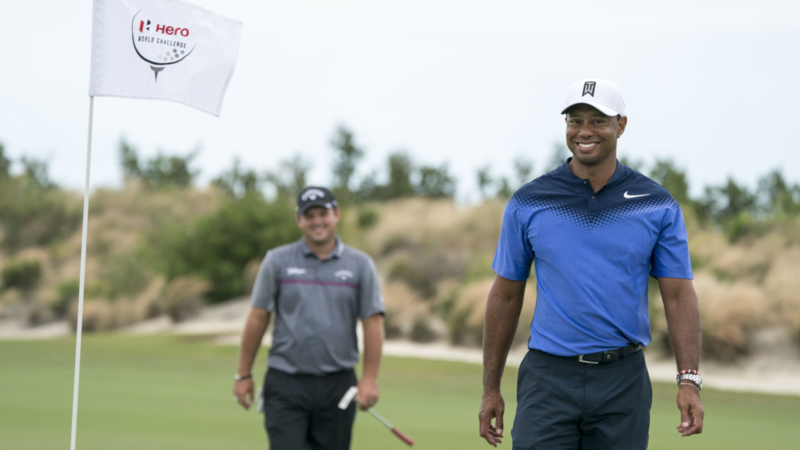 Tiger Woods ($6,500): Because of his elite birdie-making ability, his popularity among most DFS players, and his $6,500 salary (fourth-lowest in the field), Tiger will likely be one of the three highest-owned golfers in guaranteed prize pools (GPPs). Francesco Molinari ($6,600): One way to find value plays in our Models is to leverage our Longterm Adj Rd Score metric. Molinari checks in with the eighth-best LT Adj Rd Score (68.6) and the fifth-lowest salary this week. His run of six straight made cuts includes three top-20 finishes. He is making his debut at this event this week. Henrik Stenson ($7,800): The No. 1 rated player in CSURAM88’s Model, Stenson finished second at the HSBC Champions in late October and was 35th in the European Tour’s Turkish Airlines Open earlier this month. Stenson is tied for fifth with his 68.4 LT Adj Rd Score and ranks fourth with his 15.8 LT Adj Bird Avg. Henrik has been this event’s runner-up in his past two appearances. Woods’ fall has been swift and stark: He used to regularly tee it up as a 2-1 favorite, but his pre-tournament odds haven’t been better than 10-1 in nearly four years, at the 2014 Honda Classic.